Just because you are vegan doesn't mean you have to give up the cookout favorite creamy potato salad. This ubiquitous summertime side dish is made with mayonnaise, and sometimes includes eggs, both of which aren't part of a vegan diet. This simple recipe made from scratch, however, substitutes vegan egg-free mayonnaise, making it perfect to bring to a picnic, potluck, or serve at your outdoor vegetarian barbecue. The flavors are best after some time in the refrigerator, and even better after chilling overnight. If you don't have any vegan mayonnaise on hand, you can make your own. Drain the potatoes in a colander and cool completely about 15 minutes. Gently toss together all the remaining ingredients in a large bowl; add the potatoes gradually and mix with the ingredients until evenly distributed. Potato salad is appreciated as a dish that acts as the yin to the yang of sweet side dishes like baked beans. 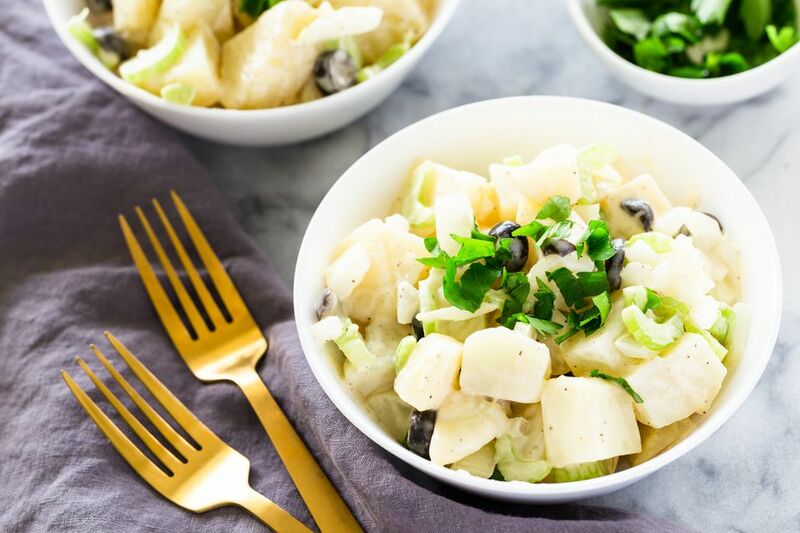 Though this recipe is perfectly delicious and complete as it is, if you'd like to give it a little something extra, there are a few additions that will make this vegan potato salad even tastier for guests. Consider adding freshly ground black pepper or mix in 2 teaspoons of paprika for a smoky taste. Add 1/2 cup of yellow mustard to add some tang to the dish; a bit of minced or diced pimento will create a succulent sweet taste while a little sweet pickle relish or chopped gherkins add a tasty twist. Fresh herbs such as dill, tarragon, rosemary, parsley, and chives (or a combination) are always welcome, and capers contribute a nice salty slant while providing another texture. Going vegan may be easier than you think—knowing how to replace ingredients in traditional recipes to make a recipe vegan is a key to bringing them into your new healthier lifestyle. Many traditional potato salad dishes use hard-boiled eggs and mayonnaise in their recipes. Removing these ingredients will almost always make them vegan. If using a vegan mayonnaise is undesirable (or you just don't have any on hand), you can replace it with olive oil and Dijon mustard to add creaminess and to help the potatoes and spices meld together. Though the color may be off-putting, avocado is also a great healthy fat to add to a potato salad in place of mayonnaise.